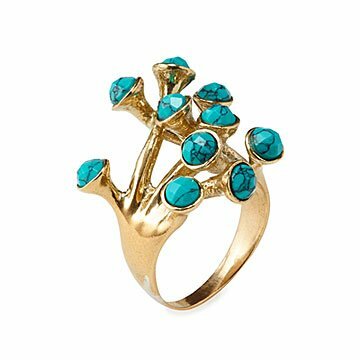 Decorated with ten teensy "buds" of turquoise, this ring merges the organic and the abstract. With all the beauty of a blossom emerging from the vestiges of winter's snow, this ring's tendrils twist and turn to form a link that traps your finger. Decorated with ten teensy "buds" of faceted turquoise, all ethically sourced, this handcrafted brass ring merges the organic and the abstract—a perfect blend for the nature lover with a free-spirited sense of style. Handmade by artisans in India, where turquoise unfortunately doesn't grow on trees.